Nasser Hussain believes England should not rest James Anderson for their upcoming Test series against Sri Lanka. The 36-year-old became the most prolific Test seamer after taking the final wicket in the last match of the series against India at The Oval, surpassing Glenn McGrath's 563 scalps. Despite reports the hosts may leave Anderson at home when they fly to Asia in two weeks, Sky Sports pundit Hussain believes the bowler is not the type of player who will benefit from a lengthy break. "England will have to decide how they are going to handle Anderson," Hussain said. "He is bowling brilliantly but he is not someone I would rest. "There are certain bowlers you can give a month or two off and they are going to come back fresh. "He is someone that you have got to keep going, he will have enough rest built in because he is not playing white-ball cricket. Keep him and (Stuart) Broad going and hope they get through to the end of the Ashes next summer." The match also signalled the end of Alastair Cook's career with England as the former captain retired from international cricket with a fairy-tale century. Following the end of the game, an emotional Anderson paid tribute to his "best friend" Cook, admitting that a dressing-room without the opener would not be the same. And, Hussain added that the pair were role models for young, aspiring cricketers. "It was a nice comment for Anderson to say he wanted to go past McGrath while Cook was still was still on the pitch," Hussain said. Anderson and Alastair Cook join Ian Ward together for one final time to talk about the impact they've had on each other and England cricket. "He realises when he turns up at Galle, Cook will be on his farm in Bedford and when he went past McGrath he wanted his best mate in cricket there with him. 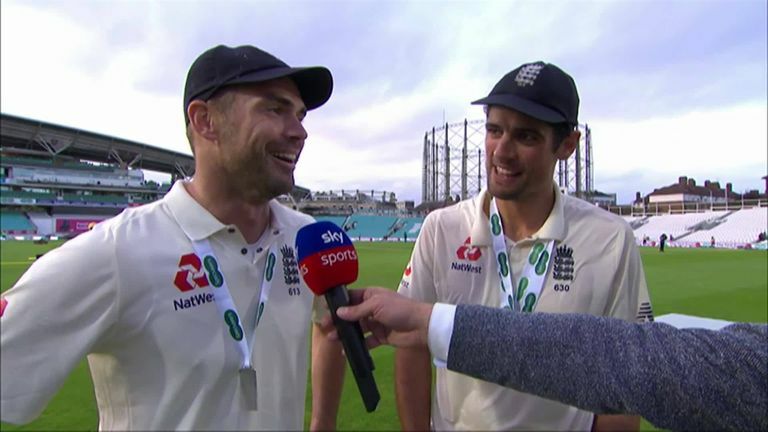 "Cook and Anderson are both not only great cricketers but great role models for the sport. Young boys and girls watching the game, trying to develop their skills, they should look at how they go about their business. "Cook has been a great role model even in difficult times. It is always easy being a good role model when you're getting runs. "When you're losing the Ashes 5-0 and there are various things going on, he has kept his dignity and his class." Another bright spark for England during the series was the form of vice-captain Jos Buttler, who played his first Test match in 18 months on the back of a prolific season in the Indian Premier League. Despite some questions being raised over the wicketkeeper-batsman's ability to transform his skills from T20 cricket to the longest format of the game, Buttler ended the series against India as England's top runscorer - having scored his maiden Test century at Trent Bridge. With Ben Stokes having been stripped of the vice-captaincy after the incident in Bristol last September, that mantle was handed over to Buttler in May and Hussain believes the 28-year-old can be a leader in the side for some time to come. "Jos Buttler will take over as a leader in the side now Cook has gone," Hussain explained. "I see him as a real quiet talker in that team but when he talks the team listen and he talks a lot of sense. "I see a future captain in Buttler, he has got a very smart brain and he has shown that when he batted in this series."